The capsules are designed to sit, stocked with provisions, in a backyard, garage or on a flat roof. After a tsunami alert is issued, residents in at-risk areas enter the Survival Capsule, buckle themselves into the seats’ four point harnesses and wait. The pod floats atop the tsunami waves (Sharpe compares the effect to trying to hold a beach ball underwater) and has an optional bottom tether to keep the pod from being swept miles away. The weight of the pod’s water storage tanks keeps the occupants upright and allows ventilation via air vents in the roof, and emergency air tanks provide 60 minutes of oxygen should the capsule become temporarily submerged. Why a tsunami survival capsule? Well, we have all seen the tsunami signs at the beach, but what do they really mean? Depending on the location, it means a fast moving wave potentially 100 feet high could be at the beach in less than 15 minutes. Great, so what are your current options? In some locations vertical evacuation structures are available, in other locations you have to evacuate inland and uphill. Keep in mind, the earthquake that created the tsunami potentially destroyed your evacuation road. 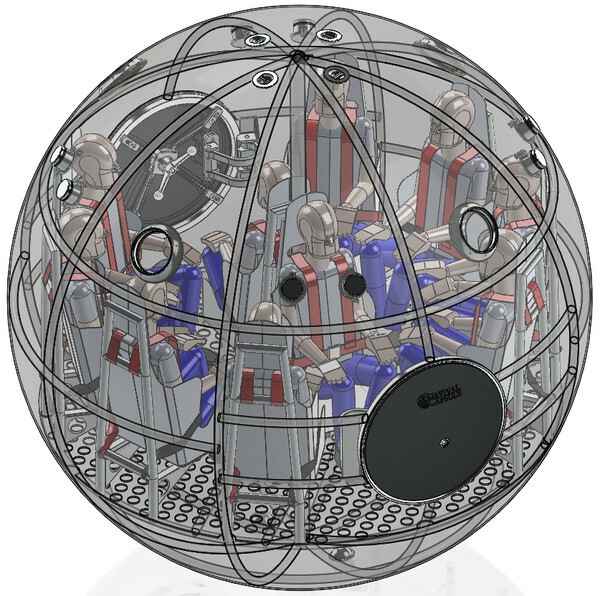 A tsunami Survival Capsule provides an alternative to horizontal and vertical evacuation for areas that have limited evacuation warning time and for individuals that are incapable of evacuating themselves. We are aerospace engineers that specialize in making airplanes as light as possible without breaking. If you have ever taken a commercial flight, you have seen our work. How does that help you in a tsunami? We teamed up with a world renowned tsunami expert, Dr. Eddie Bernard, who helped us understand what kind of conditions to expect during a tsunami. The results were staggering; tsunamis pack a punch. However, using the same abilities we use to check aircraft structure we designed a Survival Capsule capable of withstanding the punishment. In fact, our two person capsule is so strong you could stack 10 cars on top of it! There are 130 countries around the world affected by these disasters and 7 million exposed in the USA. Currently Japan is forecasting a loss of approximately 300,000 lives if the Nankai Trough creates an 8-9 magnitude, which has a 70% chance of occurring in the next 30 years. We hope to reduce the future loss of life with our capsules and by educational outreach. StemLock, Wonderful Low Tech Solution to Bike Theft. A lot can be said about Kryptonite locks but simple solutions sometimes are the best answer. I am not saying that a lock does not help but this solution is great, hidden and well prefect. Stemlock integrates two new functions into the bicycle. On one hand, it simplifies storage and transport. On the other hand, it is a powerful protection against theft. Stemlock is the first lock integrated into a multifunctional stem. Using a simple pressure and a quarter turn to the left or to the right, the handlebar is quickly aligned along with the frame and the wheels. With one turn of a key, the handlebar is disassociated from the fork, making the bike absolutely impossible to be ridden or conducted. FiveFingers Shoes, YUP, They Will Pay Millions To Those Who Bought Their Shoes! Well it didn't take as long as I thought, but only after a few short years, Vibram is going to pay millions to those who bought their shoes and thought it would changed their life. Well it did, it messed them up. I have to say, Newton Running, gives you a tutorial on running in their shoes, how to build up on millage, get used to your shoe. Vibram did no such thing. Vibram USA, the company that makes FiveFingers running shoes, has agreed to settle a lawsuit that alleged the company made false and unsubstantiated claims about the health benefits of its glove-like footwear. According to the court filings, Vibram settled to put the matter to rest and avoid any additional legal expenses. “Vibram expressly denied and continues to deny any wrongdoing alleged in the Actions, and neither admits nor concedes any actual or potential fault, wrongdoing or liability,” read the court brief.